GreenRope is the world's first and only Business Operating System. When your organization consolidates and simplifies sales, marketing, and operations in to one platform, it saves you time and over 80% total cost of ownership, while giving your team the tools it needs to get ahead of the competition. 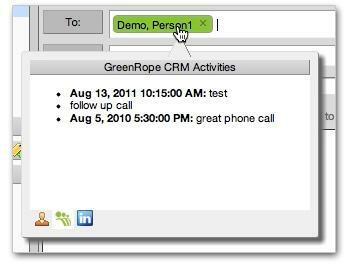 The GreenRope Zimlet offers convenient automatic integration between your inbox and your CRM. Instantly call up CRM data as you're writing your emails. 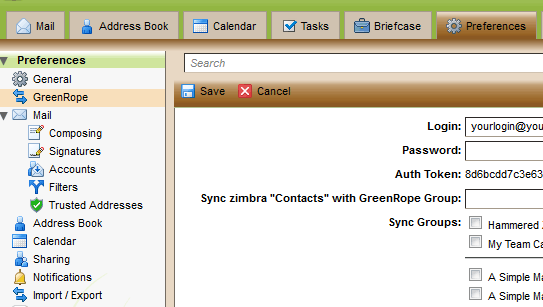 Synchronize your contacts from specific groups in CRM along with your contacts in Zimbra. All of this with a simple pricing model that grows with your business. Additional users each have their own access rights, are free, and you can have as many as you want. This Zimlet doesn't work any more with Zimbra version 8 and above.